Earn $0.76 in Rewards credit (76 points) What's This? The core of the matter. No more messing with needle nose pliers or whatever clever contraption you've MacGyvered to remove your valve stems. 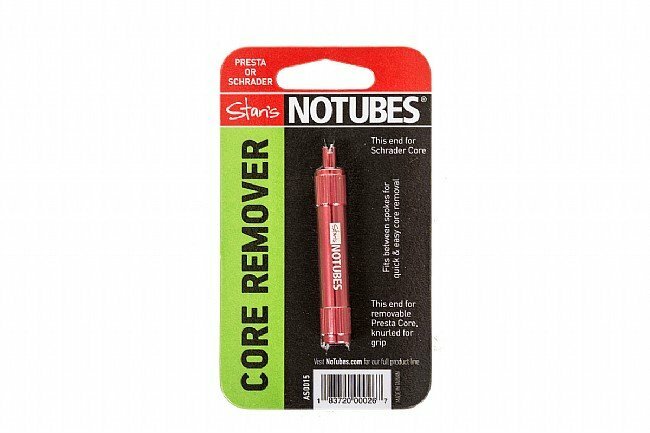 The Stans NoTubes Valve Core Remover makes it easy to unscrew Schrader or removable Presta valves with its slim CNC-alloy design that fits easily between spokes. Both the Presta and Schrader ends of the tool are knurled to provide grip during use. Anodized red finish. This is a very handy tool if you do your own tubeless set-ups and maintenance. I've used the small plastic presta core tools and this works way better. Large enough to get a grip on yet small enough to carry easily. Super simple to use and does the shop effectively. This is a must for any riders going tubeless. Easy to use. Excellent product. Great tool. Surprised to also find out it works on multiple types of valves.